War of the Worlds (2005) is an interesting blend of all the previous versions of the the story and probably the best big budget science fiction remake of the aughts. 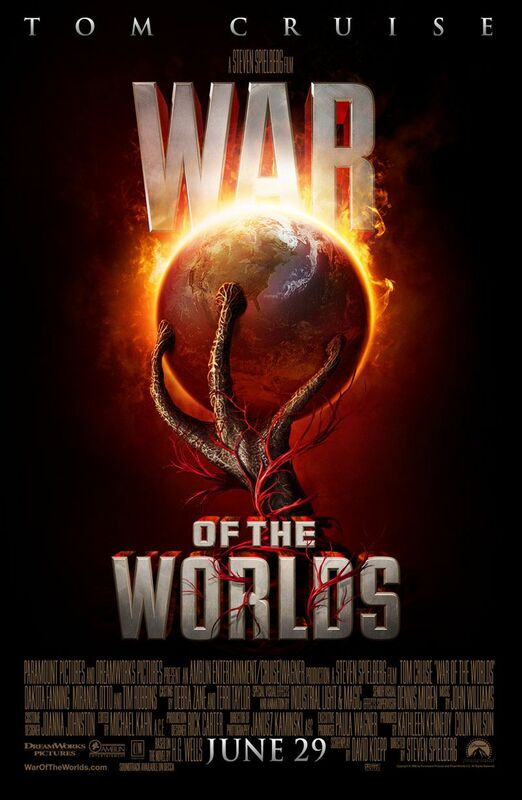 We get our standard 'War of the Worlds' into read by the voice of God himself, Morgan Freeman. Our main character, Ray Ferrier, leaves his job and gets his kids for the weekend. His son refuses to even acknowledge him and even his daughter seems disappointed to be there. After they settle in, a lightning storm appears and strikes one spot multiple times. This leaves a tiny hole that is cold around the impact site. Soon that area cracks and caves in and giant mechanical tripod emerges. It howls and fires its heat ray, vaporizing those around it. Ray escapes and goes to try and get his kids out of harms way. This film has some great scenes that are more daring and striking than most studio films dare to be. The scene where Ray realizes that he's covered in human ash is a very effective addition that I never would have thought to add. There's also the river scene where Rachel sees hundreds of bodies floating down the river. Not to mention the confrontation about the van. These help the fact that we're dealing with a story most people know and the anticlimactic nature of the ending. Even issues with the characterization are forgiven in this harrowing film. Ray Ferrier is a deadbeat Dad who works the docks and is taking care of his estranged kids for the weekend. He's good with cars, which comes in very handy as he solves the EMP issue. The character growth isn't a huge change by the end, but the things he is put through leave a definite mark. He is a loathsome character at the beginning and an okay one by the end. Rachel is his overly intelligent and inquisitive daughter. She is allergic and has back problems... These stupid, forgettable quirks aside, her character is actually used effectively in the film. Dakota Fanning gives one of her most convincing impersonations of a human child that I've seen. Robbie is Ray's delinquent son proves more capable and less stupid as the movie progresses. His real turning point comes when he saves some individuals cling to a ferry as it flees the martians. Unfortunately, his fatal character flaws that involve a strange fetishization of the military. This isn't explored much from his point of view, but leads to some more character building for Ray. Harlan Ogilvy is a man who gives them shelter near the end. He's a combination of the curate and the artilleryman of the novel, and the combo really works. His scenes are a blend of several that take the suspense of the novel with some of the visuals of the classic film. It even takes the best scene of novel and takes it to an uncomfortable extreme. In this version the martians arrive in electromagnetic lightning storms, similar to the EMP used in the 1953 film. They also have shields, again from the '53 version. The heat ray is present, but once again they are without their siege weapon, the black smoke. In this version the martians buried their tripods on earth in the past and came down in small lightning propelled pods. The martian tripods are cool, but the actual martians themselves looked too similar to standard Hollywood aliens for my taste, though this film does bring back their original motivation for invasion. Yes, I know they're never called 'martians' in the film, but calling them 'unnamed Spielberg aliens' would be really irritating. I'm just going with martians to keep it consistent. Spielberg never names his alien races anyway. "Is it terrorists?" This film clearly shows the date through cinematography and style. It is right in between 9/11 and the economic crash. This film has all the sense of terror and destruction that I found lacking in the previous one. As the world descends into chaos, humans become as great a threat as the martians (if not greater). The scenes of destruction are palpable and incredibly rendered. The end is faithful to the original with an overly sappy end for our main characters. There is a bit where the army takes down an already dying tripod that I'm not sure why it was added, other than to add in an homage to the 1953 film. They did kind of edit the 'man's responsible stewardship' message, but most of the intent is there. This includes a reading directly from the end of the book by Morgan Freeman. Tom Cruise singing "Little Deuce Coop" was a definite low point of the film, but it's really just on of some minor personal issues with this. I feel this film actually helps me justify watching the '53 version and one ups it by incorporating more of the novel. This film provides a gripping reinterpretation of the story in a big action blockbuster. Be sure to check it out. Finally, I don't end on a low note! Looking at my plans for the future, I don't think they'll stay that way.